(These pages are based upon an article by Rue Ekins and Richard Collingridge, published in the British White Cattle Society Journal in spring 2002. The article was aimed mainly at cattle farmers. See www.britishwhitecattle.co.uk). Many precious pasture habitats are protected as Sites of Special Scientific Interest (SSSIs) -- but protection does not necessarily mean proper management. Some (such as moorland) are still managed as part of a farmed landscape, but many others are now islands in a sea of intensive grass or arable land. Lack of grazing -- by the right stock -- has become a serious problem which conservation organisations are beginning to address through initiatives such as the Grazing Animals Project (GAP) and Local Grazing Schemes (LGSs). Livestock used for conservation grazing need to be hardy, easily managed, and able to live on rough forage. If they provide a marketable product and look attractive, so much the better. 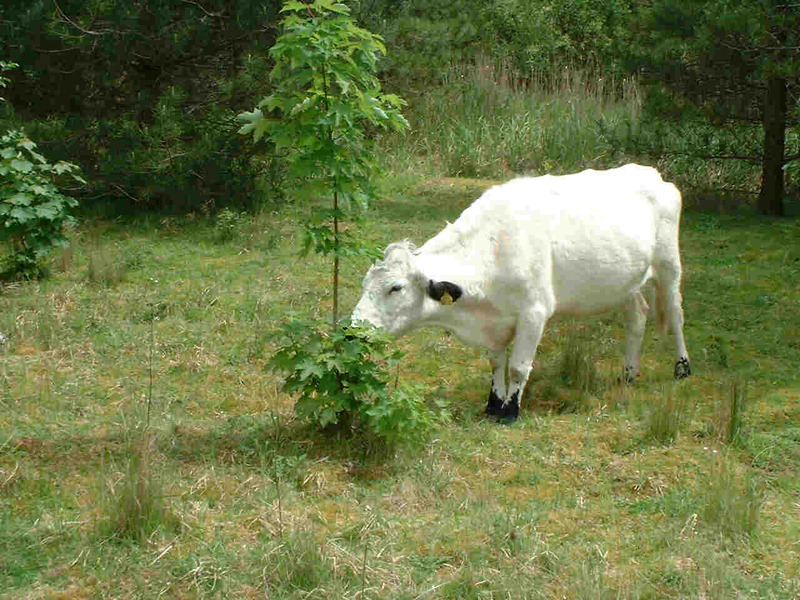 British Whites, with their parkland history and little intensive breeding, have similar characteristics to the animals which created these habitats over hundreds of years -- they too can thrive on land where many modern breeds would starve. Our cattle live up to their heritage, and there seems to be little they won't eat. If it doesn't have large spikes all over it, munch-munch-munch, down it goes! Thistles, nettles, rushes, brambles and young trees disappear almost as quickly as grass -- even the calves are eating rough stuff by a week old. They cope very well with "problem" species such as Japanese knotweed and salal (Gaultheria shallon), and several have learnt to break down invasive sallow and birch scrub in "elephant" fashion. The main things they do not seem to eat are larch, poisonous rhododendron and some kinds of pine -- and they are cautious with new plants, only nibbling for the first few days (see photo -- a careful first encounter with sycamore, which was stripped three days later). If grass is limited in winter, a little supplement is useful. If necessary we feed some concentrates daily (up to two and a half kg each) and an occasional Rumevite block. Provided there's adequate bulk forage they can then stay out grazing the land instead of having to be yarded.